Things don’t go quite as planned though, as their simple errand turns sour fast when Jimmy Wang Yu brazenly uses the Phoenix Lute on a group of bandits, intriguing the watchful eyes of another thief hiding in the trees. He easily steals the lute from them when they aren’t paying attention, starting in motion a cascading series of swords and lutes changing hands throughout the picture. The Flying Tiger Clan villains also seek the Seven Stars Stone, the only artifact known to cure the wounds of the Phoenix Lute. With both in their possession they’ll be unstoppable! The Sword and the Lute does something completely unexpected and makes Petrina Fung Bo Bo the star of the film. I can only imagine that this was because of her wonderful contribution to the success of The Twin Swords, but I doubt many were clamoring for a kid-fronted sequel. 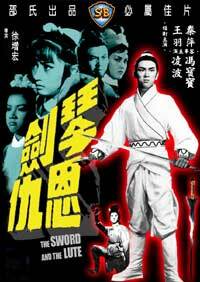 In any case, Lo Lieh is also back against all odds after being murdered by hundreds of arrows in The Twin Swords. Instead of some wild resurrection plot, he plays the previously unknown younger brother to the Lo Lieh in the prior film. Hey, I like Lo Lieh so any excuse is a good one to get him in the movie. Chin Ping and Jimmy Wang Yu are barely in the movie at all and are really just guest stars despite higher billing. Oh, and if you enjoyed the Jin Clan from the previous films, they’re gone too except for the kid. Sui Jang Hung’s camera is still solid and communicates the story well. He doesn’t do anything very risky or terribly impressive within this film, but it works and I have no real complaints. It is interesting to note the use of (or lack of) some things that would become Shaw Bros. standards. Snap zooms are virtually non-existent in the three films, with one major one in The Twin Swords and a couple of slower ones that are questionably classified as snap zooms in this film. This one also features some undercranked fast motion film to increase the feeling of action and danger within the fight sequences. The use of it is only minor though and actually does the job in making the fight more exciting despite my general dislike of the tactic. Simply put, this is better than Temple of the Red Lotus, but not as good as The Twin Swords. If you’ve seen the first two, this is worth watching for its few fun moments, but it won’t set your world on fire. My main issue with this one is that it isn’t more like The Twin Swords, which is semi-unfair of me, but in a sequel, I think it’s a fair criticism. Some viewers may end up preferring this one depending on their tastes though, as they traded most of the fantasy elements for shadowy thievery and intrigue involving bandit clans living in caves. If that’s your sort of thing, then you may be more pleased with this one that I was…but the thing is, I’m down for some shadows and cave bandits so maybe I’m giving the film more credit than it deserves. There is a guy that shoots exploding fire marbles from his bow, so you have to at least appreciate that. Ivy Ling-Po returns as the Scarlet Maid and continues to be my favorite character of the series. She enhances every scene she’s in and gets another chance to show her badass skills during the final battle sequence. I’m surprised within all the varied Shaw Bros. productions that they never made a standalone Scarlet Maid film, as that would make for one hell of a martial fantasy. Alas, like her lair on the foggy mountaintop, it is only in dreams. I’ll leave you with the choice wisdom that the Scarlet Maid bestows upon Petrina Fung Bo Bo before she rides over the hill and the film ends. hahaha, yes. Words to live by.